Felicity turned her back on her investigative journalism degree to start a business as a party planner. When her friend is accused of murder, her inquisitive nature is rekindled and she quickly becomes Senoia’s premier super sleuth. She soon finds herself involved in murder mystery after murder mystery. If she is going to save her friends, and herself, she must solve everything from crimes of passion to mass murders. Can Felicity overcome long odds or will it be too much for the young party planner? 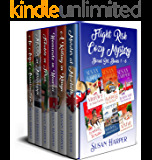 This collection includes all twelve books in the Senoia Cozy Mystery series. 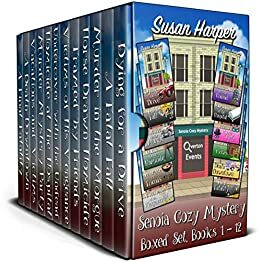 If you like cozy mysteries with interesting characters and unexpected turns, the Senoia Cozy Mystery series is for you. Buy the Senoia Cozy Mystery Boxed Set and start solving your next mystery (or twelve) today! Dying for a Drive - When Felicity gets her first big break as a party planner, a murder turns the event into one that she will never forget. After the police arrest her friend, who she knows is innocent, she is forced find the killer herself. A Fatal Fall – Felicity’s party planning business is booming after solving her first murder. When she lands her biggest job yet, she finally has a chance to enjoy the fruits of her success . . . until a young girl falls to her death. Murder in the Morgue – When a haunted house gets an all too real decoration, Felicity is thrust into the middle of another murder investigation. Horse Drawn Homicide - When someone close to Felicity is killed, she literally gets dragged into the middle of another murder mystery. But after a second murder, things get too real. Can Felicity solve the mystery before she becomes the third? Framed by Friends – When the past and present collide, Felicity’s friends, old and new, become embroiled in a murder mystery. At a party she organized, no less. Victims of His Vengeance – When the criminals Felicity put behind bars start dying, she must again solve a perplexing case. Can she catch another killer or will she be the final victim? Undercover with the Undead - Felicity has landed the dream job of throwing a zombie themed party for the stars of her favorite show. When a dead body shows up, for real, she gets thrown into a celebrity-infused murder mystery. Homicide at the Hospital – Felicity is preparing for the long-awaited wedding of two friends. When the groom-to-be is fired and his boss winds up dead, the happily ever after is very much in jeopardy. Murder Mystery Party –A murder mystery party seems to be the perfect way to have fun with her two passions. Until someone turns up dead for real. Vacations and Victims - Felicity and the crew have graduated to preventing murders. After foiling an attempt on the senator’s life, Felicity takes some time off to enjoy a vacation with her sister. Unfortunately, she soon learns that when you’re a super sleuth, you always seem to be in the right place—or wrong?! ?—when dead bodies turn up. A Death Downtown – Felicity has put her party planner hat back on and is set to host one of the biggest events of the year in Senoia. When old friends get involved, it has the feel of the good old days. Until a dead body shows up. A Final Fatality – Felicity Overton has put numerous criminals behind bars…and planned a few bang up parties in the process. When one of her deadliest mysteries is resurrected, it might prove to be too much for her to handle. 5.0 out of 5 starsWow! Great series, from start to finish. So much to love about this whole series! Great characters, really well fleshed out. Intriguing mysteries. Original plots and storylines, so well written and thoughtfully put together. 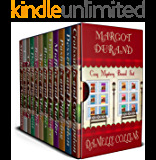 Definitely a must read if you enjoy cosy mysteries. This series is one of the best! 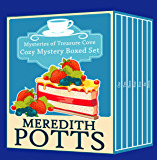 A fascinating series about a party planner, Felicity, who also becomes a super sleuth with the help of her friends, combining her two businesses to become a powerful force in the search for justice in her quaint town full of interesting characters. I enjoyed the interactions between the group of friends as the series developed, noticing particular skills of her friends who help her solve the murders. One book is particularly dark and sombre as quite a few characters are targeted. Will Felicity be the next one? If you are looking for a nice read with good characters this is a good read. I wish the author& editors had paid more attention to continuity from one "book" to the next. Changing reasons for things to happen when you are writing a box set and everything is interconnected makes it confusing for the reader. 4.0 out of 5 starsI thoroughly enjoyed these stories. I had low expectations given the ''cozy mystery' description and indeed there were several glaring errors of fact. The most noticeable being a killing using cyanide from apple seeds in Georgia the Peach tree state. Peach pits being one of the richest natural sources of cyanide. Apple seeds are comparatively Harmless. Still I read the whole series and considered buying another book by the same author. 5.0 out of 5 starsTERRIFIC! DON'T WASTE TIME ...ORDER NOW FOR HOURS OF GREAT READING. Each book is a stand alone although the main characters continue through the series. The plots are believable and the "romance" is a nice touch but hardly overwhelms the mystery. 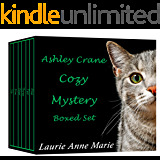 This is the best value on Amazon if you like cozy mysteries. A delightful set of cozy stories about Felicity and her friends. Each story has a murder which begs to be solved. I love this set. Usually, I read one and then read a notable book like a Hemingway, and then read another Cozy.